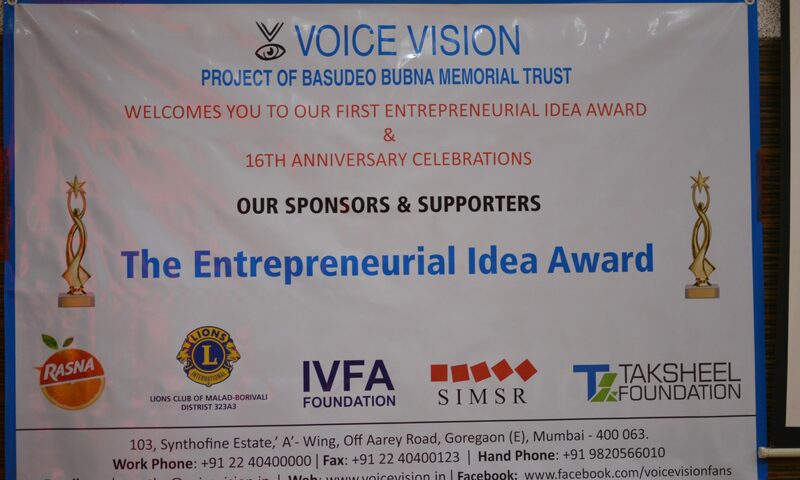 Voice Vision constituted a unique award for enhancing entrepreneurship opportunities for persons with visual impairment. The aim behind introducing the said award was to enable persons with visual impairment to start their own business and bring about an attitude shift from seeking employment to generating employment. In addition to this it also aimed at empowering the participants with the process of bringing an idea to life. The program was flagged off in December 2015 by inviting business idea applications from persons with visual impairment across India. We received 10 such applications and after analyzing the qualifying criteria, they were selected to participate in the competition. In January 2016, all the 10 participants were teamed along with 100 social entrepreneurship course students of Somaiya Institute of Management Studies and Research. 10 groups were formed comprising visually impaired participants, Somaiya students and mentors. Working as a team was beneficial to both the students as well as the participants. The students got a hands on experience on how to work on an actual idea and on how to formulate a business strategy for the same. Also, this enabled the students to grasp the prospects and complications that a person with visual impairment has. In a similar manner, this event was a great learning platform for the participants, where they got a chance to discuss their ideas with their respective teams. Insights on how the business idea is evaluated and the different practical aspects of bringing their idea to life were few of the important concepts which the participants got to learn from their teammates. Each team worked together to evaluate, analyze and understand the feasibility, scalability and practical implementation of the ideas. In a span of three months the teams were ready with their business models. Voice Vision celebrates its anniversary each year on 3rd April. Hence, to mark this day with the dream project of Ms. Bubna, the final Award day was held on 3rd April 2016. We celebrated two great moments on this day: First Entrepreneurial Idea Award for persons with Visual Impairment- A moment of pride for all of us including the participants and volunteers. Secondly, the 16th anniversary of Voice Vision. We heard the 10 participants, their business ideas, evaluated them and selected the final awardees. Each of the ten teams presented their business model to the jury panel. The jury members included Mr. Sanjiv Saraf, Vice President of CII and ICICI Securities, Dr Gaurav Buch, Head HR at Rasna Ltd, Ms. Paroma Bhattacharya, Incubation Associate at Un Ltd. India and Mr. Vasant Sanke, ex-MD of NHFDC. After questioning and proper evaluation of the business models, three awardees were selected, out of which one women awardee was mandatory. The Judges evaluated the participants based on the content and the feasibility of the idea presented before them by the participants. The judges did put quite a weightage on the market research done by the teams before coming up with their ideas. They were fair in their approach towards finding the right kind of startup idea that could be implemented and was beneficial in the long run. The winner of the event was Mr. Dilip Mane. His business idea was of candle making and he is presently operating his own candle making business. The first runner ups were Mr. Naushaad, Mr. Rasheed and Mr. Ajeesh. Their business idea was of developing a Web Accessibility Software. Among the three Mr. Naushad is a Social entrepreneur in Web Accessibility, Mr. Rasheed is a Doctorate in Web Accessibility from JNU and Mr. Ajeesh is presently working as a Web Accessibility tester in IBM. The second runner up was Mrs. Vidya Pawale. Her business idea was of a massage Parlour. She is currently working as a freelance masseuse. Prize money for the winners, first runners up and second runners up were Rs. 51,000, Rs. 31,000 and Rs. 21,000 respectively along with certificates. Additionally, Rasana had agreed to sub-vent the first three teams’ loan interests up to amounts of Rs. 5,00,000, Rs. 3,00,000 and Rs. 2,00,000 per annum for the next five years. Apart from the winners, participants also contributed with ideas ranging from floriculture websites, adventure aero sports to homemade chocolate making and many more. We were obliged to our sponsors for they were the ones who made this event reach its new milestones. Our sponsors encompassed of Rasana Ltd, Lions Club of Malad – Borivili district 323 A3, Secret Sponsor and Taksheel Foundation. As the day did behold the 16th anniversary, special scholarships were awarded to students of SIES College which were sponsored by Taksheel Foundation. We extend our appreciation to Prof. Radha Iyer & Prof. Asha Bhatia Madam for believing in our idea, for they helped us to formulate the structure and thus bring it to life. We also prised their devotion towards the entire process. We are grateful to SIMSR, for extending venue and volunteer support to us. We at Voice Vision are thankful to the chairman of Rasna Ltd., Mr. Piruz Khambatta & HR Head Dr. Gaurav Buch, for sponsoring the loan opportunities and for co-sponsoring the event. Also, a token of thanks was extended towards our anonymous or secret sponsors, for their valuable contribution and support to this event. We express our gratitude to Mr. Rajit Mehra, President Lions Club Malad Borivili district 323 A3 for the valuable support he offered. We acknowledge our heartfelt gratitude towards all our jury members for giving their time especially on a Sunday, thus enabling us to evaluate and finally select our winners. We also expressed our appreciation to all the charismatic volunteers, SIMSR Consultancy Cell, PR Cell, Social Entrepreneur Cell, the advisory team and Ascent Networks Pvt. Ltd. for all their contribution to this event. Post the event, we also circulated a Feedback form for everyone who was a part of the event. The result of which was that people found the event to be well-structured and a great learning experience for them. We were asked to organize more of such events in near future with more focus being put towards promotions, so as to increase the visibility of such altruistic events with more and more participants being a part of it.